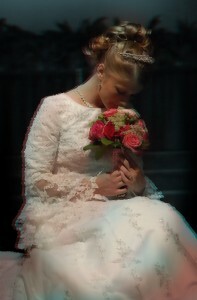 Award Winning 3D Wedding Photographer for Hire! Unless you have 3D glasses, the photograph above is nothing spectacular however with 3D glasses the photograph above comes to life in three powerful dimensions. Details on the bride’s gown and flower accents in her bouquet sparkle as the three dimensional depth effect fools your mind into believing you’re actually inches away from the altar. Looking to Hire a 3D Wedding Photographer? You came to the right place! With over 20 years experience covering weddings in 4 continents, I am confident I can produce timeless 3D photographic memories for you at your upcoming wedding. Call or email for availability and rates. Not already shooting 3D? Don’t hesitate to contact me or drop by the studio for help with your 3D Wedding Photography business. Posted in Weddings and tagged 3-D Wedding Photographer, 3-D Wedding Photographs, 3-D Wedding Photography, 3-D Wedding Photos, 3D Wedding Photographer, 3D Wedding Photographs, 3D Wedding Photography, 3D Wedding Photography Studio, 3D Wedding Photos.